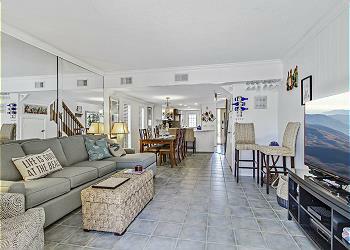 Beautifully renovated and redecorated 2 bedroom, 2 bath villa located in the South Forest Beach. Just steps to the beach, you will love this beautiful villa! Everything is new from the flooring to the new furnishings. The homeowners didn't miss a thing! The main living level hosts the kitchen, dining room, and living room. The kitchen has all new stone countertops, stainless steel appliances, and an eating bar with seating for 3. The dining room has seating for 6 and the living room has all new furniture, as well as a flat screen TV. The sliders lead out to a private patio with convenient access to the pool and beach!. Upstairs is home to the master suite and 2nd bedroom. The master bedroom is outfitted with king bedding and a wall-mounted TV. The master bedroom's private bath vanity has a gorgeous marble top and the walk in shower has beautiful custom tile. The 2nd bedroom has 2 double beds, a TV, as well as a private bath. The vanity in this bathroom also has a lovely marble top and the tub/shower has all new tile. It's just gorgeous! This little slice of heaven is your new home away from home!